Well not on my own - but with a lot of help from Dutch team-mates Fred, Sander and Jeroen, I am now the proud possessor of a bottle of Glenlivet XXV. More of that later. An eventful day began with a quick visit to the Dufftown Whisky Fair, and say hi to the Tomintoul/Glencadam crowd - there's also stalls from Duncan Taylor, Cadenheads, Whisky Castle, Dream Drams, Gordon & MacPhail/Benromach, but I've only time to gulp down a few drams, mainly from G&M, who won't be there on Sunday, as I then have to dash off to Rothes to visits all 4 remaining distilleries, and Forsyths, who make the stills (and other equipment) for most non-Diageo distilleries. It's about 8 miles form Dufftown to the far end of Rothes where the Glen Grant distillery is situated and the tour will start, the weather is better than yesterday, though it's still not very spring like, and I decide to take the road rather than the Speyside Way to Craigellachie. This proves to be quicker and in no time at the Speyside Cooperage for a quick photo stop, then Craigellachie Distillery for a little bit longer. Then it's down the hill and on to Rothes, with just a brief stop for a picture of Ben Rinnes, now with new snow on top. Finally, the sun comes out, and a further stop is required to take the jacket off!! Arriving in Glen Grant, I seek advice from one of the visitor centre staff about parking the bike, and am shown to some suitable railings around the back. Frank and Geraldine are last to arrive again, and then Assistant Manager, Greg, takes us around the distillery. 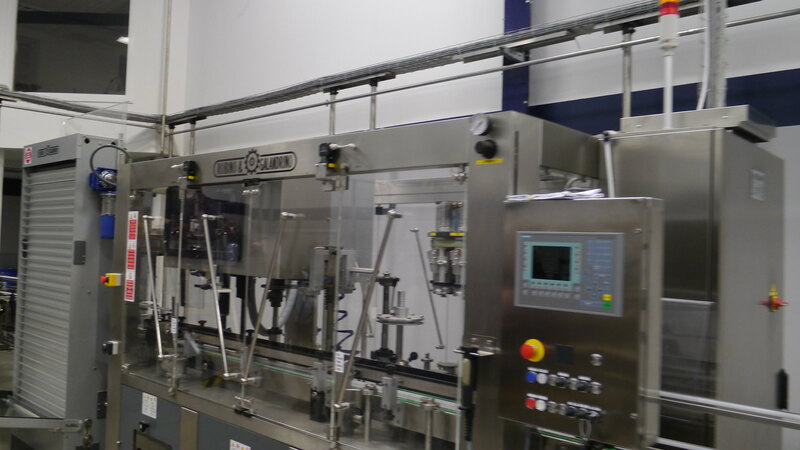 We also have Ed Dodson along - he normally organises a similar trip for the Elgin distilleries, but that's not running this year as both Linkwood and Mannochmore aren't available due to building work. A sample from the washbacks is passed around - it's like hot beer without any hops - not really to my taste, but a couple of people think it's great.The feature of this tour is a detailed description of the Glen Grant purifiers, including an up close look at them. They work in a different way to those at Strathmill and are clearly visible from the floor, and when we are taken up to the gallery, it's clear to see (and feel) how they work. They are large tanks of water continually fed with a supply of cold water. inside of which is a further vessel fed from below by the lyne arm - the lighter spirit will escape via a secondary lyne arm to the traditional condenser, while heavier spirit is re-liquefied to fall back for further distillation. Purifiers are fitted to both wash and spirit stills. A dram of 10yo Glen Grant with some whisky fudge follows, and we head for the bus to take us on to Glen Spey. Glen Spey is in the middle of Rothes a few yards from the main street on the road signposted to the castle and golf club. It's a small Diageo distillery, like Strathmill branded as J&B, and not normally open to the public. We are greeted there by Paula MacDonald, a former manager of the distillery and are shown around by her and a colleague from the distillery, whose name unfortunately escapes me. Glen Spey's malt mill, like that at Strathmill is of German origin, but of more recent origin, and much smaller - nothing much to look at compared with the big red Porteus mills in many distilleries, but as Glen Spey is not open to the public it doesn't have to pay too much attention to its looks - stills are not polished and gleaming like those at Glen Grant, but this makes them look more functional. Glen Spey also uses purifiers, but only on its spirit stills, and the condensers have had to be boxed in to prevent a repeat of the winter damage that occurred a couple of years ago. The distillery's entrance is adorned with the name Spey Royal as well as Glen Spey. 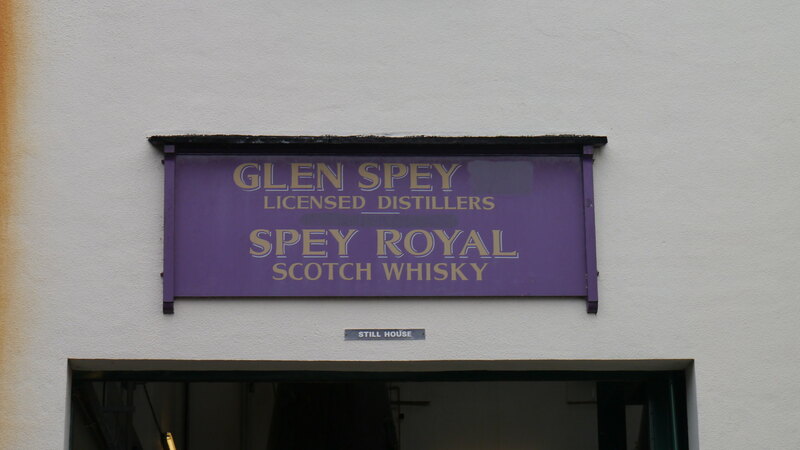 I have pictures from 2004, when the main sign at the distillery read Spey Royal - a closer look at the pictures does reveal that it says Glen Spey Distillery, home of Spey Royal. The Spey Royal blend is no longer available in the UK, but is apparently a big name in Canada. The access to our next distillery, Glenrothes, involves a half mile bus trip back through the middle of Rothes, though actually the two distilleries back on to each other. Although again Glenrothes is not normally open to the public, it is built on a much grander and imposing scale than its neighbour - it produces a lot more whisky too. We are met by Alasdair Anderson, who starts off by explaining some of the complicated story of who owns Glenrothes - the simple answer is the Edrington Group, but this isn't the whole story, as Edrington has only 70% of the 1887 Company who are the actual owners of Glenrothes, Highland Park, The Macallan ,Glenturret, Brugal Rum and 50% of the North British Grain Distillery - with Diageo. Edrington are in turn owned by the Robertson Trust, a charitable trust set up in 1961 by the grand-daughters of William A Robertson founder of Highland Distilleries in 1887. The other 30% of the 1887 Company belongs to William Grant & Sons (Gleniddich). 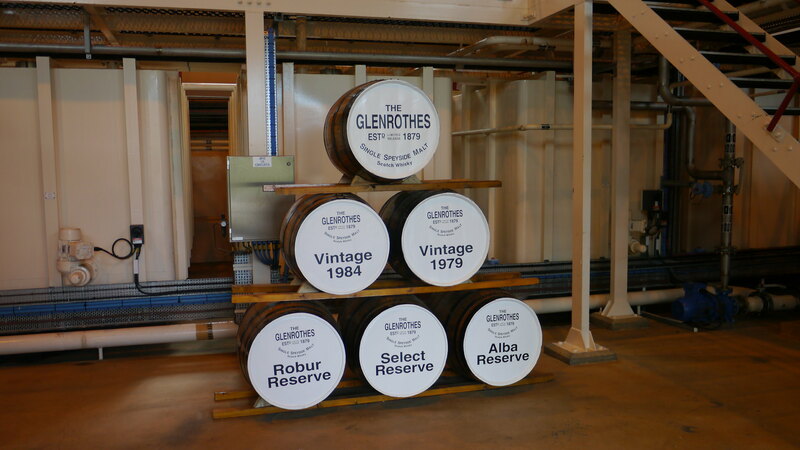 The Glenrothes brand name however is now owned by Berry Brothers and Rudd, who exchanged it for the Cutty Sark brand in 2010. None of the above should be confused with a different William Grant of William Grant & Co who was one of the founders of the Glenrothes Distillery in 1878. Right, I think I've got my head round all that. Glenrothes does have a nice big red picturesque Porteus mill, it has a mixture of stainless steel and wooden washbacks, and now uses condensers, having switched from worm tubs in 1963. The stills themselves are housed in what was once a malt barn - when the distillery still had its own maltings - a massive building known as the cathedral. 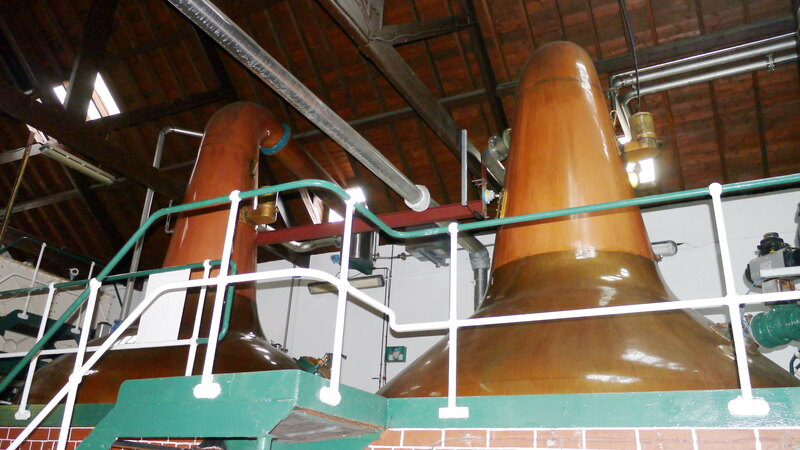 There are 5 pairs of stills, but the cathedral has room for at least another pair should there be the need to expand production again - it can currently produce 5.6m litres a year. The tour is completed with a dram of the 1995 vintage in a small glass, which we get to keep. The problem with these glasses is they make it easy to get a noseful if you nose too vigorously - which I did on this occasion - not recommended! I'm a little cautious about our next destination, Forsyths, as they don't make whisky. 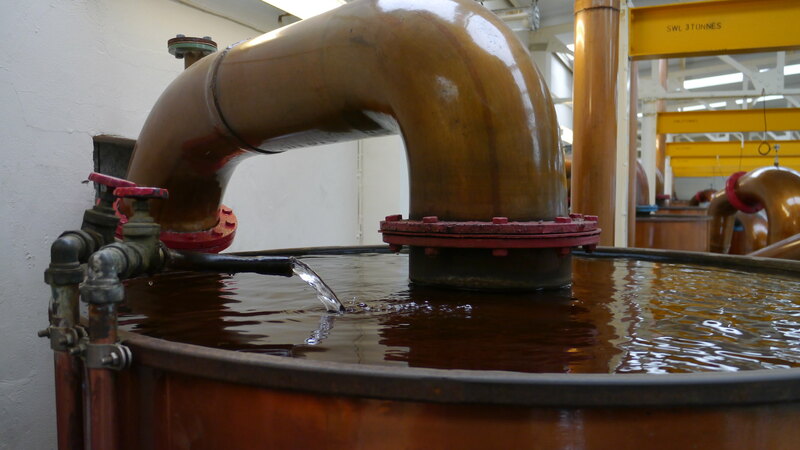 They do however make stills, and it turns out to be fascinating. We are guided round by Mary, who has now retired after many years at the plant, and she explains some of what goes into making a still. One of the production staff is at work today to provide us with sight of what actually happens - in particular how the copper is pounded to smooth the welded seams - which might otherwise be porous. There's a lot of copper lying around, from sheets to parts that are recognisably bits of still. These are marked with the distilleries for which they are being built - including "Glen Carron", which we are told is not to be taken as the name for the rebuilt Imperial distillery, but just a working name they are using. There are also replacement parts for Balblair and Kininvie amongst others, and at least 3 new stills for an expansion at Ailsa Bay. A new spirit safe for Laphroaig is also in the workshop, and then we are taken to the pit - where large parts are suspended for their pounding. The Forsyths plant has expanded into what was the former Caperdonich distillery and its former stills are still there - now apparently bound for the new Falkirk distillery. 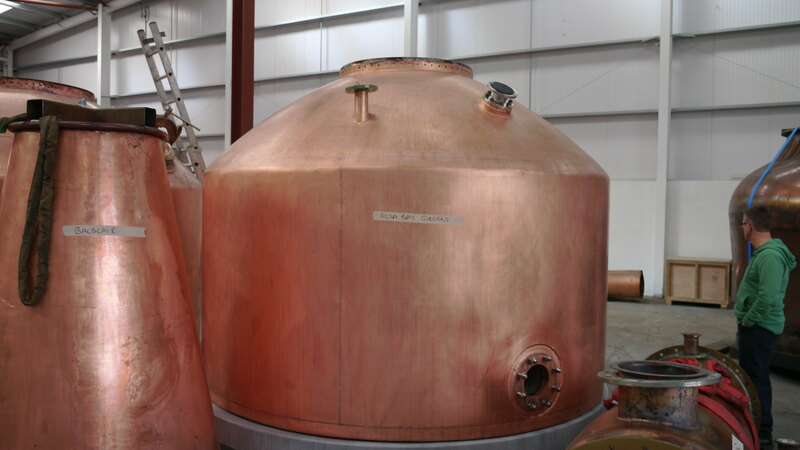 There's also a massive copper-domed mash tun, not sure if that's ex-Caperdonich too. Then it's time for a trip out of town to the Speyburn distillery. It seems that Inver House aren't too committed to showing people around, as they have no-one to show us around - that's left to Greg from Glen Grant. The mill is a Boby; the mash tun, copper-domed, the washbacks are made of wood, and the stills are dumpy. Very much a cursory visit, and then we're given miniatures of Speyburn 10yo. Then we go back to Glen Grant for a tour of the new bottling hall - which while not unique is a rarity for distilleries - Springbank, Edradour, Glenfiddich, Bruichladdich and Kilchoman are the only other, I think. A lot of money has been invested into the equipment and some of it is proving troublesome - particularly the labeling. Unfortunately it isn't operating today. We then have the option of having a further dram in the gardens or in the visitor centre, the visitor centre is the popular choice and we are given a dram of Glen Grant 170 - a 2010 bottling to commemorate the 170th anniversary of the distillery. There are also bottles of the 5yo on the table, which is what ordinary visitors would get - its youth is very evident, but it's extremely popular in Italy. I have to leave to get back to Dufftown in time for the coach to Glenlivet, but Ed Dodson is outside handing out 20cl bottles of a Festival blended malt. I got to the Hotel with about 15 minutes to spare, which just gives time to freshen up, a change of shirt and a visit to the ATM. the bus is right on time, and we head off - the presence of Dave Broom on the bus causes some concern - if he's a competitor in the Challenge, other teams won't have much chance! Once we get to Glenlivet Dave tells me he's banned from the Challenge and is only there to judge the tasting notes and read out some of the questions. I'm given the choice of making up the numbers on table 3 or 4 who currently have teams of three. For no real reason I choose 3 and find I'm paired up with Fred, Sander and Jeroen from The Netherlands. we have 100 questions in front of us, but the top three teams will win bottles of Glenlivet ranging from 18yo to 25yo. I recognise a few people at the event including one of last year's winners. Frank and Geraldine are at table 21. Time for a little revision on Glenlivet history from the dates on the wall. We get a dram of Nàdurra to start, but it's a cash bar after that - still drams of Nàdurra at £2.50 isn't too bad, but other than Glenlivet there's not much else on offer. Down to the serious business of the questions. By the time of the food break - after 7 rounds a list of the tables in the running is read out - and we're included as are table 21 and the Danish Drinking Team. Haggis neaps and tatties, followed by cheesecake and coffee and a none too successful attempt to write tasting notes on the mystery dram (which turns out to be Glenlivet 17yo Cask Strength). After all ten rounds there are three teams tied - ourselves, table 21 and the Danes. So we've won a bottle of some sort. Tie break time. But first the tasting notes. Our irreverent "forget the notes, just taste the whisky" at least got a mention, but table 21 wins - so they've got two bottles! Still tied after a further three rounds. Sudden Death - after a couple of questions, there's lots of discussion among the officials - it's getting late or they're out of questions - it's decided that the prizes for second place will be shared - turns out that's been the problem all along. A winner is declared - we've won! Glenlivet XXV comes in a very elaborate ash box - it's also a very heavy box - every silver lining has a cloud! Still for now it's time to enjoy the success - only trouble is it's time to head for the buses home - and my team mates are on the Elgin bus, but they're coming to the whisky fair tomorrow.